A combination of Comfort and Luxury in Deer Valley! A place that takes your breath away and let's you relax in total comfort and luxury - for a great value! Located just 5 minutes from the base of Deer Valley and the Snow Park Lodge, this beautiful custom-built home is located in the prestigious Hidden Oaks community, offering amazing views from both the front and back of the home. Skiing is just minutes away (1.5 miles) at the world-famous Deer Valley ski resort, and just 2 miles from Old Town Park City where you can enjoy great restaurants and shopping. Skiers will love our two-car heated garage and the 6-pair ski boot/ski glove dryer. The front-loading washer and dryer are conveniently located in the alcove off of the spacious mudroom. Our 5 bedroom, 5 ½ bath home is perfect for two families who want to vacation together or one family who wants room to stretch out! Our home is comfortable and well-appointed, with over 5,000 square feet of spacious living areas and stunning views of the Deer Valley and Park City mountains. In-floor radiant heat keeps the whole house warm during the winter months. The stone patio features a private 6 person hot tub and a gourmet gas grill. The house was designed with comfort in mind. The sleeping arrangements feature luxurious cotton sheets, hypo-allergenic pillows and down comforters in each of the 3 master suites, each with a king bed, ensuite bathroom and private deck. The two suites upstairs have their own fireplace, Jacuzzi tub, separate shower and walk in closet. The fourth bedroom has a twin and a double bed as well as its own sunlit bathroom. The fifth bedroom is a kid's dream, with 4 bunk beds, ensuite bathroom and a TV/DVD/VCR (Game Boy player available upon request). When you're not on the slopes, you can enjoy mountain views, a roaring fire, or your favorite DVD - our home has it all. There are two comfortable living room areas, each with their own wood-burning fireplace. The stereo system can play satellite station music or CD's throughout the first floor. The family room features a large TV with surround sound and cozy seating. Window seats throughout the house give everyone a comfortable place to hang out with a favorite book. The large custom dining room table and high back chairs comfortably seats 10 people - and the matching bench can be used to accommodate up to 12! If that’s not enough, there is kitchen countertop seating for 6 more. For those of you who can’t leave the office behind, we have high speed wireless internet service and a multifunction laser/fax/printer for your use - and you can't beat the views while "working"! Whether you visit our home for the amazing skiing during the winter or the hiking, biking, fishing, golfing (and so much more) during the summer, you will do it all in luxury and comfort. LONG TERM RENTALS AND SPECIAL PRICING FOR SUNDANCE AND PRESIDENT'S WEEKEND IS CURRENTLY AVAILABLE!!! We are both professionals who live and work near Washington, DC. We have three boys who all love to ski, snowboard, mountain bike, fish and hike. We love our spacious, warm home and look forward to spending time there with family and friends as often as we can. It's an amazing place to gather and relax. We love it because the views are wonderful and give us a moment to catch our breath. This is simply an awesome house in an amazing location. The people are friendly, the air is fresh and the pace of life is relaxed. There is so much to do: ski, snowboard, mountain bike, fish and hike. Or just relax and enjoy the hot tub, surround sound TV system, board games or nooks and crannies to read a good book. We love our spacious, warm home with fully stocked gourmet kitchen. It's an amazing place to gather and relax with family and friends. And don't forget to look out for moose and deer that frequently pass by! We had a wonderful visit in this home and we were a large crowd, three families! The home is beautiful and very comfortable. I was surprised at how luxurious the house is, the pictures do not do it justice. We especially like the three master bedrooms, great for the three couples. The kitchen was fabulous as well as the large living space. Our entire experience was great! I would highly reccomend this rental. We have rented many houses in the area and I have never had such an accomodating owner, very nice man. We have stayed in 10 homes in the past 10 years, all in Park City, or Deer Valley. This home has the best kitchen, extra fireplace, and great accessories, comforts, and quality. Our group of six adult men had a blast. The weather was warm, but in other times the heated garage would have been a real treat! Great grill, hot tub, and sound system for those who chalet more than they ski! Thank you! So Relieved.... Because You Never Know Until You Get There!!! The house could not have been more perfect for adults and/or kids. The amenities were ideal for relaxing after skiing and just hanging in for the day. The kids had plenty of room, so much so that you didn't even know they were there. The Mud Room for all the ski equipment was a god sent and the kitchen functioned perfectly. The housekeeping girls were very thorough and nice. Will definitely rent again. Home was beautiful and exceeded our expectations. This was our third rental by owner and the best by far. It was well appointed, especially the kitchen. Excellent selection of movies for everyone age group. Hats off to the snow removal crew. They did an excellent job of keeping the driveway and patio cleared of snow. No small feat given we had at least 30 inches the first two days we were there. Everyone in the group wants to go back. Already planning for a return visit. Excellent recommendations for restaurants. Do not miss Hapa Grill in Redstone. The hamburgers are the best around. But, the salmon and tuna are worth the trip. Great Home in Deer Valley! 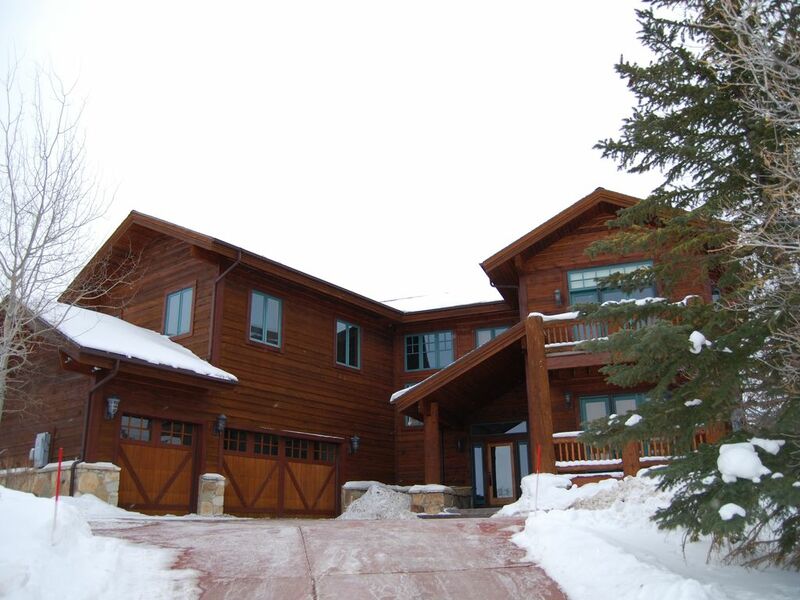 My family and I stayed in this home during January of 2011 and had a great ski vacation. This home is very accurately portrayed in the description and the pictures. We have been renting vacation houses in Deer Valley for 15+ years and this one had the most complete amenities, especially a great kitchen equipped with anything you could possibly need or want. The owners of this property were delightful, honest and very easy to deal with and they went out of their way to accommodate a special request that we had. The house, the location and the owner's are all Wonderful. Everything that we could ever ask for in a vacation home. The house is immaculate, you will not be disappointed. Our time here was in the late summer, Deer Valley and Park City have epic mountain bike trails, the Old Town of Park City is nothing but picturesque. There is plenty to do for the young ones and the ones that want to be young again! Highly recommened house!